oday we’re goind to show you a laptop with a typical Lenovo desing – the IdeaPad Z580. Good enough for gaming and standard work. The main material used for the corpus is a high quality polycarbonate, which is embossed and has a glossy finish. There are also metal elements. It weights 2 kg and 609 gr, and its dimensions are the following: 376mm width, 232mm depth and a thickness of 33mm. If you look at it from the side, the platform lays horizontally. Another advantage is the 180 degrees viewing angle. The display is with a 15.6 inch diagonal and is wide enough for gaming and watching movies. It has a 1366×768 pixels resolution and uses the economic LED technology. This also contributes for the more realistic look of the colors. We were pleasantly surprised to find out that display of the Lenovo IdeaPad Z580 has a semi-glossy VibrantView cover. Its there to protect the eyes of the user. Another advantage is the 180 degrees viewing angle.Our tests showed good transmission of the basic color settings while gaming with the basic color settings. At the upper part is located the HD WEB cam with 1.3 MP with 720p. And the sound comes from a certified Dolby surround digital with 2W power. At the upper part is located the HD WEB cam with 1.3 MP with 720p. In out opinion the tight opening mechanism has all it takes for years to go without problems. Going through it we get to the keyboard. It’s a really important feature for laptops that are good for gaming. This one is the well known for its qualities when it comes to button lovation island-style. The buttons are wide, soft and quiet. Also an advantage fot the gamers the full sized arrow keys, which are often used in various games. Also fullsized is the touchpad – with a multitouch, gesture recognition and two monoblocked buttons. As expected, considering its dimensions, the periphery is rich in ports and stuff. There’s an optical device that also is a CD/DVD recorder, and the card reader is 5 in 1, recognizing formats like SD/MMC/MS/MS pro and XD. The USB ports are 4 – 2 of them are the standard version 2.0 and the other two – the 10 times faster version 3.0. There are also VGA and HDMI ports taking care of the analog and digital connections. 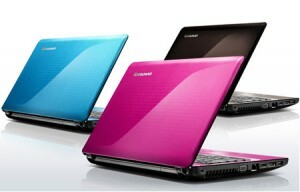 Lenovo IdeaPad Z580 uses the recently announced Ivy Bridge technology. The processor is Intel Quad Core i7 3611QM with 6 MB L3 Cache and each of the cores running at 2.1 GHz. With the extreme Turbo Boost it could rich 3.1 GHz. RAM memory could be 8GB DDR3 at 1600MHz or 4GB. Despite of that the hard disc is rather impressive – 1TB 5400 rpm SATA. The graphics card is NVidia GeForce GT 650M using its own 2GB GDDR3 memory. Its even perfect for 3D games. We didn’t notice any lagging in Call of Duty or Pro Evolution Soccer.